Among the various kinds of entertainment, enjoying video is one of the most pervasive ways. There is at least one media player on each computer for video playback. Making a simple search of free media player on the Internet, you would find tons of software supplied, and every one possesses its own specialties. Thus, to find a multi-functional suitable media player is not a piece of cake. Here I will introduce you 5KPlayer to enrich your digital entertainment in 5 ways. A free media player is much popular than a paid one with the same functions. But usually, some free programs are designed to serve ads to users, others are designed to track users’ personal information. It is a big problem for us. However, there is still certain free and safe players provided, such as VLC and 5KPlayer, etc. Test approved that no adware, plugin, malware or spyware is found in this program. It is completely free and safe for you to have a comfortable audiovisual entertainment. 5KPlayer works with the most popular video and audio formats and forms, ranging from AVI, WMV, RMVB, 3GP, FLV, MKV in the video category, to MP3, WAV, FLAC, AAC, APE for music. One of its amazing features is to deal 4K UHD videos smoothly, let along general 480p SD or 720p & 1080p HD videos. Even VLC may stumble while playing a 4K video. Moreover, it is able to handle music, DVD, Blue-ray video and satellite radio too. Tremendous fascinating YouTube and other online resources such as music videos, sports videos, movie clips and so forth, always attract us to watch them again and again. So, to download the wonderful YouTube videos with a free online video downloader for Mac/PC or for playback on portable devices is the cleverer choice, which frees you from ads and buffer. The popular IDM is indeed a nice tool, yet IDM crack occurs too often especially in trial period. Any way out without paying extra? 5KPlayer just comes for you. From the official site, it states that 5KPlayer can download videos from over 300 hosting sites. I only tested YouTube and Vevo, it gets the job done pretty well. The latest Adele Hello MP4 [Adele 25 Album] is free downloaded with a few clicks. Just copy and paste the video URL for analyzing and downloading. Besides, 5KPlayer offers the chance to choose the video formats and resolution, which we may decide according to your need. 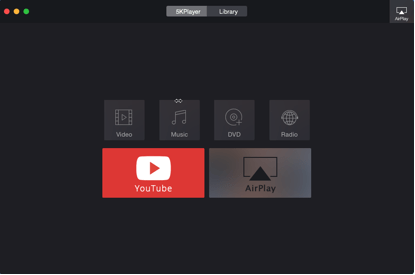 Either you’d like to watch videos on a bigger screen or record an app game walkthrough, both of them are available with 5KPlayer, which presents you the possibility with the AirPlay streaming, mirroring and screen recording function. AirPlay video or music from iPhone/iPad/iPod to Mac/PC and from Mac/PC to Apple TV. With special concerns for most up-to-date devices, it is achievable to mirror iPhone 6S/iPad/iPod screen to Mac/PC. Furthermore, you can record the screen on your Mac or PC with 5KPlayer while mirroring. Not so many media players own a clear and simple media file library as 5KPlayer’s. On the nifty interface, you can find an obvious sign of library. Here, you are allowed to control all the media files you watched/listened, downloaded or added. By clicking the heart icon, you are able to tag it as your favorite. All the files are neatly arranged in the library. What’s more, converting a video to MP3 or AAC is feasible. Free and safe 5KPlayer, extending your digital life with astonishing video/music playback, accessional online video downloading, built-in AirPlay streaming & Mirroring as well as tidy media file management, is worthy of a try.